Click the button below to add the Bezzera automatic espresso machine BZ16 to your wish list. Bezzera makes world class machines, even if the brand is not so well known as other Italian espresso machine brands, like Nuova Simonelli, Pavoni, La Marzocco. This machine is designed for Gourmet home usage, for coffee lovers who want to get a really good espresso shot and a powerful steam for all 20 friends showing up to get the real Italian stuff. Compared to the BZ07 and BZ10 series of Bezzera, this BZ16 comes with the 2.1 liter bigger boiler which provides plenty of steam power. The encasement is the one also used for Mitica and Strega. Stainless steel mirror polished with welded corners, just beautiful. Bezzera uses in this BZ16 their own commercial brewing group, of course 58mm diameter, massive marine brass. Compared to the E61 brewing group, this brewing group comes with two electrical heating elements inside of the brewing group to preheat the brewing group within 15 minutes. Remember, with all E61 brewing groups you do have a preheating time of 30 minutes or more, because the E61 uses the passive water flow between the boiler and the brewing group to heat up the brewing group. Remember, a hot boiler and a cold brewing group makes waste, not espresso. The automatic system is a real volumetric dosage system: Not by time, but by volume is the extraction controlled to get the perfect 2 ounces espresso for the double shot. Remember, if you extract more than 1 ounce per espresso shot, we are talking about a lungo, or here in the U.S. called "Americano". Well, you have 4 programmable buttons, you can set it up for 1-espresso shot, 2-espresso shot, lungo, and kind of endless brewing, close to an Americano. 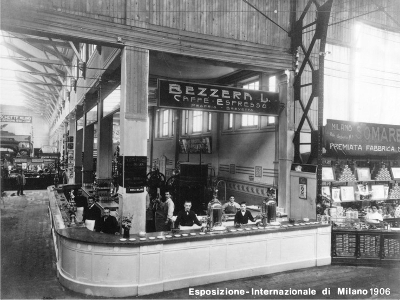 Compared to other espresso manufacturer brands, Bezzera, in business since more than 110 years, is the master of perfection in regards of the hydraulic engineering. Everything is designed perfect to assure the best possible espresso shot in this price class. Bezzera provide a 1 year warranty for manufacturer's material defects, which we extend at our cost to 2 years. It was in 1901 when Luigi Bezzera patented an innovative process for preparing coffee. This was the first espresso coffee machine, which was exhibited at the Milan International Fair in 1906. Over the course of time, the company underwent significant development, maintaining constant passion for this work, which has continued today with the fourth generation of the Bezzera family. Continuous innovation and modern transformations have not changed the philosophy and tradition of the company, which proudly maintains its complete production line in its own facilities. The entire Bezzera espresso machines production process takes place inside the company, with the utmost care taken in every stage, starting from the selection of raw materials. Particular attention is given to human resource development and the continuous technological upgrade of the machinery, fundamental elements to obtain the best final products recognized for their excellent construction, typical of Made in Italy products. The severe final inspections carried out for each Bezzera machine guarantees the reliability which makes our brand so well known around the world. All machines are tested with hot and cold water to assure the Bezzera quality. Each machine comes with a signed certificate that the machine passed all tests flawless. After testing the water inside of the hydraulic system is pressed out with air. However, some water residuals are still inside of the machine. So when you get the machine from us, it might be the case that a little humidity is visible on the machine.